Emails sent - thank you for all your support! 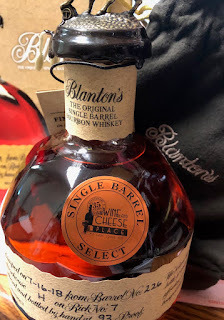 If you are in our Whiskey Reward Club (as of 09/12/18) and you have not received a bottle of our barrel of Blanton's Bourbon, sign up for the wish list now. We are mixing it up. We sent a WRC email last week and released it already. Deadline for those to be picked up is tomorrow at 7pm. You have until tomorrow (Friday Night 9/14/18) at midnight to sign up. We will draw names from everyone that signed up for the number of bottles we have available. If your name is drawn we will contact you and you can purchase the bottle of Blantons Bourbon at $53.99 for the bottle. Emails will go out on Saturday early, hopefully. Sunday at the latest. Your credit card will NOT be charged. We will confirm if your name is drawn and you will pay at pick up. Do not put anything else in your cart, if you want something else, please create a new order. Mark Herold - superstar wines! El Enemigo - big scores! !